Whoever says punk is dead is wrong. At least it isn't totally dead because in terms of music it is very much alive and has learnt how to adapt to modern times, as proven by Daily Punk. 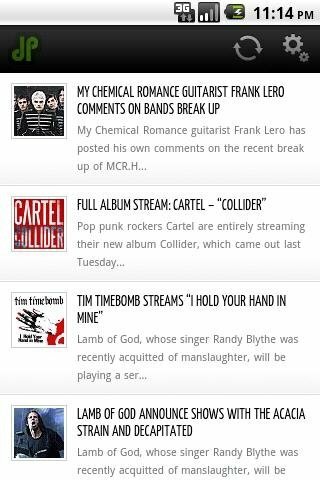 Daily Punk for Android is an application that makes the most of the search carried out by a bot on a huge amount of music information sites. The latter only gathers the news regarding the punk music world to show them to you on your mobile from newest to oldest. Continuously updated information about what's happening in the punk rock world. All the news without having to access hundred of webs. Optimisation of resources when it comes to accessing the information. Configuration options that allow you to improve its performance. Access to different news sources depending on the language chosen. Daily Punk offers fast and optimised access to punk rock's current issues, as it offers the main news headlines and the first paragraph of each article. Thus, if you aren't interested in its contents, you won't have lose any time or data capacity by loading it. If you are interested, you will only have to click on Read More to be addressed to the original source of the news, therefore respecting the authorship of the information. 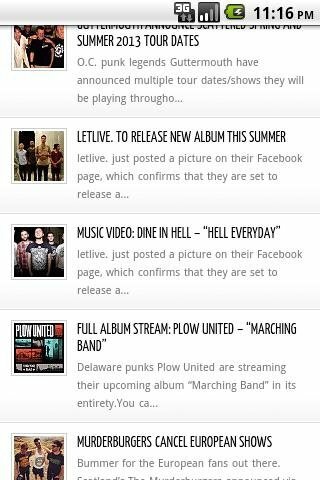 Download Daily Punk for free on your mobile and keep up to date with news about your favourite bands.